A VA-panelled 24-inch screen for less than £160? Are we dreaming? With better pixel response, the EW2420 would be nearly perfect. Still the best budget monitor out there. This is it, folks. The holy grail of LCD monitors. The Jesus H Christ of flat panels. A truly affordable large display powered by something other than a TN panel, in other words. 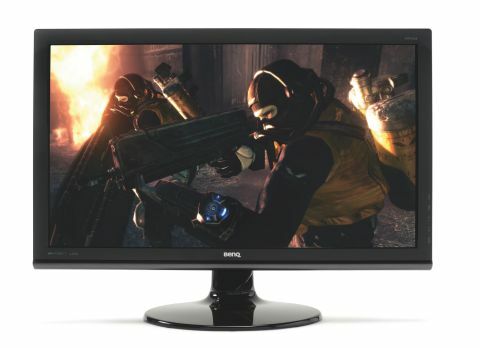 We give you the new BenQ EW2420 24-incher, yours for a whisker over £150 and sporting a VA panel. Cue much rejoicing. That's a truly astonishing price. In fact, it's cheaper than many 24-inch TN monitors. As if that wasn't enough, the BenQ EW2420 also packs an LED backlight. Of course, it's the real HD deal, courtesy of a 1,920 x 1,080 pixel grid. Like we said, this thing really does have an air of the second coming. On paper it's everything we've been asking for. It's enough to make competing monitors such as Iiyama's 22-inch E2271HDS and the 23-inch LG E2350V, both TN panels, seem instantly redundant. Indeed, BenQ's own 24-inch TN'er, the V2410T, doesn't look too clever by comparison.